Below we have details of surgical conferences that you may be interested in. Programme booklets for the events advertised are linked below. If there are any problems, please use our contact us form. ​I thought that you may be interested in the above event hosted by The Royal College of Surgeons of Edinburgh in association with Bradford Royal Infirmary on Saturday 16th April 2016 at Field House, Bradford Royal Infirmary. This national symposium will offer talks on pursuing a career in surgery, surgical research and the role of surgical simulation. 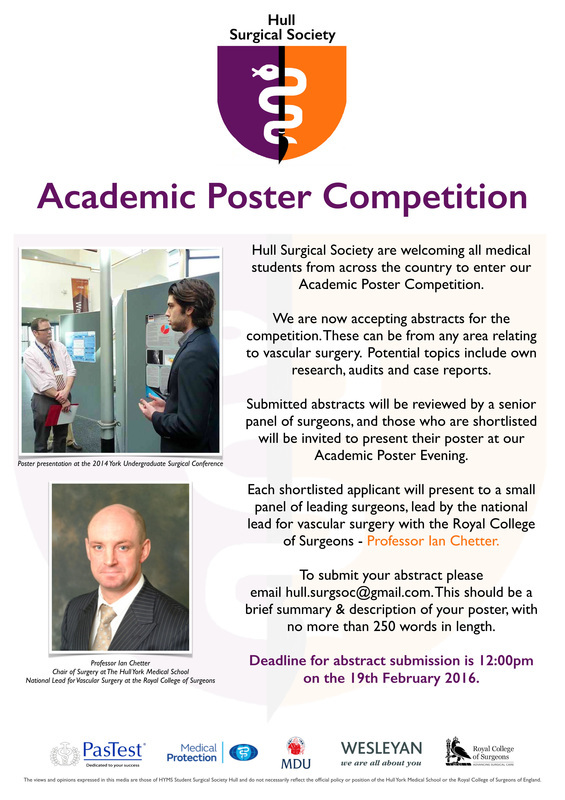 It is an opportunity for students and foundation doctors to present their research and to get involved in clinical workshops. The day will consist of lectures from expert consultants from various specialties followed by the research presentations and practical workshops. Delegates do not need to be presenting in order to attend the conference or the workshops, and everyone will receive a certificate of attendance for their portfolio. All delegates must book and pay for their place via the RCSEd website. The above webpage offers further information about the event, along with a link to the abstract submission site for those interested in presenting at the symposium. Medical Students and Foundation Doctors are invited to submit abstracts for oral and poster presentations at this research conference. Abstracts should be submitted through the Abstract Submission page by midnight on Friday 1 April 2016. Please be advised that if you do want to submit an abstract you will need to register on the RCSEd website (which you can do here), this is a very quick process and will give you access to the abstract submission site. There are excellent prizes on offer which can be found listed on the attached flyer. This event will provide medical students and foundation doctors with useful and practical information in relation to planning a future surgical career and teach them basic surgical skills. The 40th Anniversary ASiT International Surgical Conference 2016 will be held in the impressive city of Liverpool at the Arena and Convention Centre, L3 4FP. This is your chance to socialise with over 700 fellow trainees from all ten surgical specialties, listen to the latest up-dates in clinical practice, training, and workforce, and hear what the future holds for us all. Come along to get ahead in your surgical training! • The only UK-wide surgical trainee conference for all specialties. • Submit your research and audit abstracts for presentation. • Over £3,500 of trainee prizes to be won! • Abstracts are printed in Elsevier's International Journal of Surgery. • Great value pre-conference educational courses. • Educational conference programme with expert guest speakers. • Dedicated parallell session for medical students. With a fantastic selection of educational pre-conference courses, an interactive and informative conference programme and our famous Charity Gala Dinner Party held at the Crypt Hall, Liverpool Metropolitan Cathedral will make this conference the highlight of the year for all surgical trainees. Whatever your speciality and whatever your grade, the ASiT Conference has plenty to offer. Our 2016 conference aims to bring together nearly 800 surgical trainees from all ten surgical specialties. Our largest conference yet, this promises to be a memorable weekend. Barts and The London Surgical Society is delighted to invite you to our 5th National Undergraduate Surgical Conference in partnership with the Royal College of Surgeons of England on Saturday 13th February 2016. After huge success of our 4th National Surgical Conference, we proudly present our 5th National Surgical Conference this February being held at the Royal College of Surgeons of England. This year’s conference promises to be bigger and better. We will have lectures from world-renowned surgeons, exciting workshops, opportunities for you to present your work and much more! The whole event is ONLY £20. However, if you would like lunch (two-course hot lunch), there is an additional £15 charge so it will be £35. *We will be serving breakfast, tea, coffee & biscuits at breaks for everyone. For Bank transfer details are, Account number: 41453378 Sort code: 40-05-03. Please make sure your name is stated clearly when making the payment. Payment must be made within 3 days of registering for a ticket. The Mammary Fold is the national trainee group representing breast surgery trainees. WHAT: FREE research day for anyone interested in breast surgery. Share, learn and engage! ABSTRACT SUBMISSION IS OPEN TO ALL STUDENTS AND TRAINEES on any aspect of research, audit or service improvement in breast disease. Opportunity to present at a national conference - looks great on the CV! There will also be a 'dragons den' - an opportunity to pitch for the next big project taken on by the committee.